In Clearlake Oaks, it still feels like a full house in Moose Lodge 2284, even though only half of the 300 evacuees from the Pawnee Fire remain. CLEARLAKE OAKS, Calif. (KGO) -- In Clearlake Oaks, it still feels like a full house in Moose Lodge 2284, even though only half of the 300 evacuees from the Pawnee Fire remain. Despite the warmth of spirit, days and nights in here have taken their toll. Cal Fire announced residents may return to their homes as early as 4 p.m. Wednesday. Some will find ruins when they do. At least 12 of the 22 burned structures are residences. Denise Ogle of Spring Valley learned, just Wednesday morning, that flames took her house on Wolf Creek Road. She sat there, stunned, absorbing the news as friends gathered around to comfort her. "I have no insurance," she told us. "I'll have to accept help." Why didn't she have insurance? No company would sell it to her. 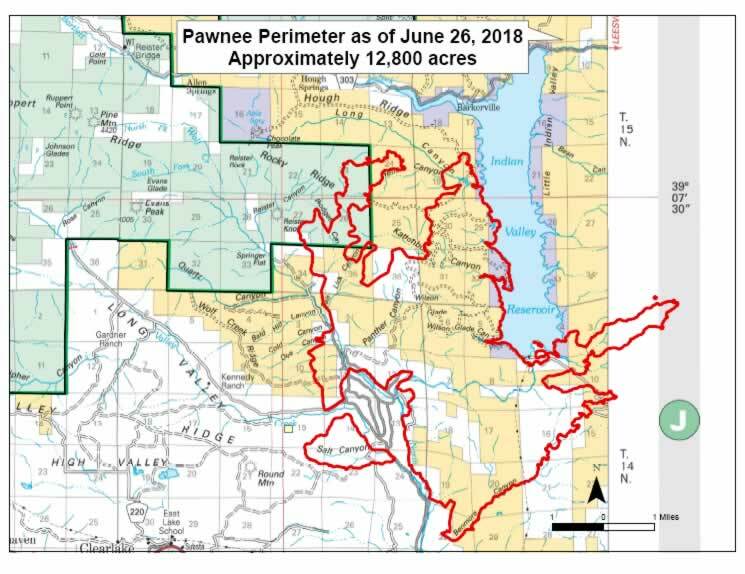 This map from Mendocino National Forest officials shows the perimeter of the Pawnee Fire burning in Lake County. The community of Spring Valley and areas served by New Long Valley and Old Long Valley Road north of Highway 20 may return home starting at 4 p.m. Wednesday, Cal Fire says. The Lake County Sheriff has authorized the removal of the road blocks located at New Long Valley Road at Highway 20 and Old Long Valley Road at Highway 20 beginning at 12 p.m. Wednesday. An evacuation center has been established at Lower Lake High School, located at 9430 Lake Street. The Red Cross is gearing up to handle up to 300 evacuees. More than 20 engines have been dispatched to contain the blaze, as well as two helicopters and several air tankers. The fire is being driven by low relative humidity, strong winds, Cal Fire said.